Please keep reading to learn about the best soundbar under $200 and $300 for clear movie dialogues and speech and voice clarity your money can buy in 2019. Upgraded entertainment viewing and sounds are the latest hype these days. With the latest technology in television viewing and gaming, people are finding ways to enjoy maximum benefit. The Orbitsound T12V3 Spatial Soundbar makes all television viewing and gaming achieve its full potential. With its innovative Spatial sound system from this British company, your movies and games will come alive at your very home. What makes Orbitsound T12 Home Cinema Soundbar different from the other advanced sound systems? Good thing you ask. Orbitsound T12 Soundbar comes with a compact and a one of a kind audio device that produces quality and clear sounds without the need to buy those massive sound systems. It delivers excellent features but saves you much space, hassle and of course added cost. Do you have the latest X Box games? Are you fond of watching 3D movies and clips? Well, if you say yes to all these, then you would probably agree with me if I tell you need an outstanding sound system to enjoy these gaming and viewing experience at greater heights. Orbitsound T12 Soundbar makes all you gaming and viewing pleasure possible. With its subwoofer, integrated amplifier and a high-quality stereo speaker, you will be able to enjoy real sounds from your games and 3D movies just the way it is supposed to be. Imagine watching the latest 3D movies with a surround sound. The experience is indeed a blast. Think of those multiple sound system surrounding your television. You would just imagine the clutter of these assorted devices plus the wirings scattered everywhere. Definitely not a pleasant sight! What’s more, the complicated set up of the wirings to connect to the television and etc. will take you more time to set up everything before you can enjoy watching. The Orbitsound Home Cinema Soundbar is designed for space saving and less wiring hassle, so you no longer fret on how to get rid of all the extra mess. It includes a single bar and speaker that fits right on your television rack plus no extra protruding wires. Also, the Orbitsound T12 V3 Spatial Stereo Soundbar is omni directional which means that you need not place your Orbitsound system at a reasonable distance from your television. It can comfortably sit beside your TV. Furthermore, its user-friendly technology allows you set up within 10 minutes. 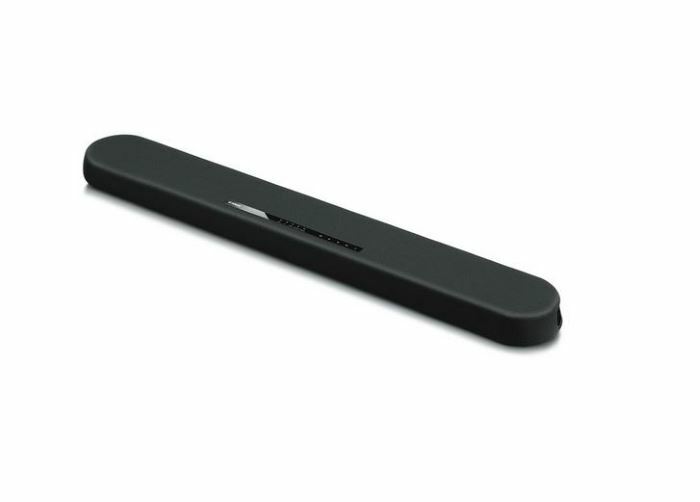 The Orbitsound T12v3 Soundbar looks and acts like a device from the future. Designed to be free of unnecessary wires and excessive space, this product has left a wake of satisfied customers with each sale. Its most beloved feature would be the support it gives with playing music from iPhones. The remote control provided with the set is not as effective as it should be, being rather cheaply made at first glance. Nonetheless, Orbitsound T12v3 is a device that is recommended to anyone who likes to have good, relaxing music floating around their home while they work. When you buy Orbitsound T12 Soundbar, not only will you enjoy the quality and clear sounds, the stealth-like shiny black furnish makes it very elegant and attractive to look at. You will love what it does to your living room… aesthetically speaking! While technology is evolving each day, the various ways in which music can be enjoyed are evolving as well. From simple speakers to mega bass systems to the latest touch of the future, soundbars, have slowly rooted themselves as revolutionary machines. The Sony HT-CT290 2.1 Channel 300W Sound Bar introduces a brand new way of listening to your favorite tracks and artists, a method which has not been properly discovered before. The concept of a sound bar is renovated by this product, allowing anyone to listen to fabulous songs anytime with the slightest ease. 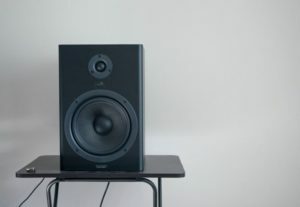 The title itself shows what the main inclusion of the Sony HT CT290 Channel 300W speaker set is. In this model the subwoofer, a vital component in making the end product’s sound quality a grand one, is wireless. It does not have to be wired to the TV set or soundbar. This eliminates hassle, as well as making the entire system very easy to set up at the first use. 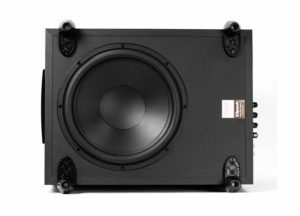 Still you should keep in mind that sub has a power cord as they have not still figured out how to make battery powered subwoofers. With a length of 35.5 inches and 300W of power output, this model supports 2.1 Channels that make it a perfect fit for TVs which are 40 inches or more in height. This device of the future also supports Bluetooth, which means that music devices do not have to be directly plugged into it to be used. Unlike a lot of other devices, this soundbar contains NFC (Near Field Technology) capabilities, which lets it apply its easy maneuvering methods to smartphones and mobile gadgets. It can be used in various ways through its ports for optical and analog usage, complete with 3 HDMI inputs. 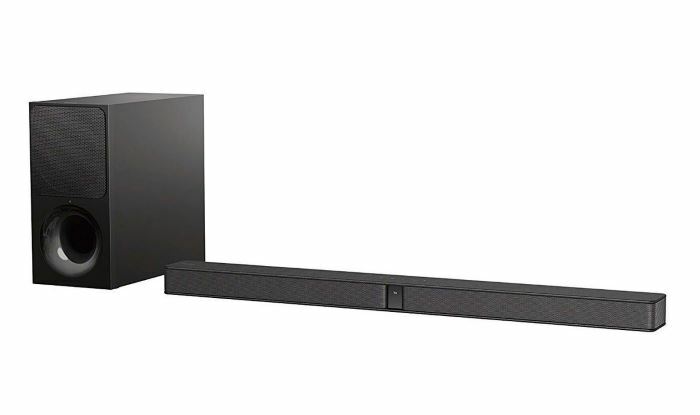 The Sony HTCT290 2.1 Sound-Bar is built to fit in any mounted position, that is, on bookshelves, cabinets, and in any upper portions of a household storage compartment. It works through a remote control that comes with the sale, which lets the user freely control the multiple sound control options that the machine possesses. The fact that the Sony HT-CT290 speaker set can be used with both TVs and iPhones is an amazing concept, even more so with the amazingness of the playback quality that is obtained from it. The special ‘Voice’ feature enables a detailing quality of the sounds that appears in the voices of characters in movies or TV shows. Despite being a product of Sony, this model works well with Samsung TVs as well, and that is a relief as it is easily compatible. 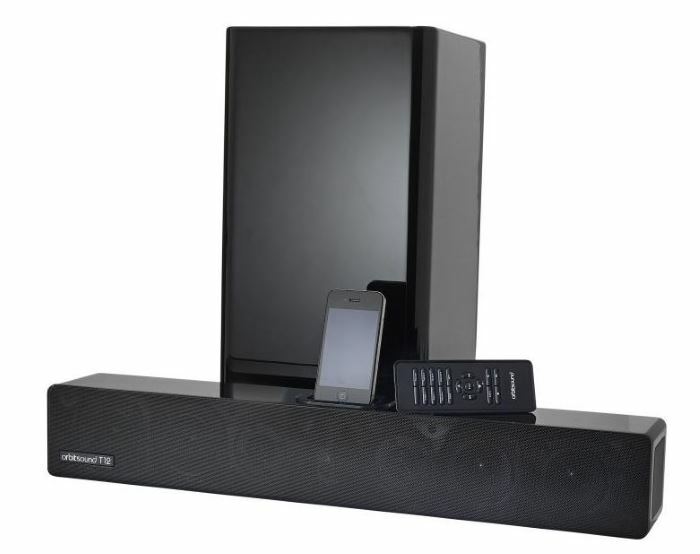 Furthermore, Apple TV, Xbox and various cable lines are also able to use these speakers to their fullest potential. 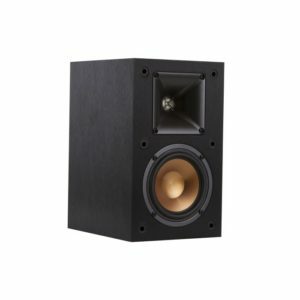 In a small room, the speakers can give out impressive results that are way above the standards of anything similar to its size and price range. The lack of wiring is a huge plus too, especially with the inclusion of the wireless subwoofers. One of the most common complaints customers had with the Sony SoundBar is that it apparently has a short lifespan. A lot of the models sold burned out or stopped working entirely after a few weeks of usage, and that is a discouraging element for any product. The subwoofer has been reported to be faulty at times too. The Sony HTCT290 Sound Bar with Wireless Subwoofer is the kind of device any home theater system would happily welcome. Because it goes along with just about everything, it still remains a relevant product in its own category. If you are looking to spice up your love for music, give this a try.